Math 3 On-Track | Mac App Storeのアプリ検索・ランキング BuzzMac! Third grade math keeps skills moving up, up, up. Help kids soar, as the numbers get bigger, and the functions more complex. 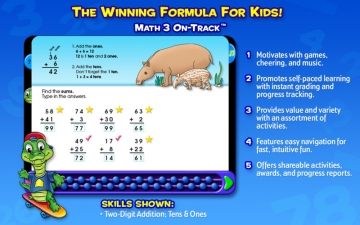 With this Math 3 On-Track program, kids can practice three- and four-digit addition and subtraction, work with story problems, sort larger numbers by greater than/less than, use expanded notation and become proficient with products and quotients, as they progress in multiplication and division. It’s a fun, creative tool for developing more advanced math skills. A handy onscreen scratch pad allows for working and solving the problems, then typing in the answers. This app “tracks” a child’s progress, color-coding correct/incorrect answers and giving third graders an at-a-glance review of their work. If they make a mistake they can select the red bead at the bottom of the screen and rework the problem. Combined with audio guidance, step-by-step instructions, and instant grading, Math 3 On-Track promotes self-paced learning. Large, colorful graphics and animations enhance the experience. 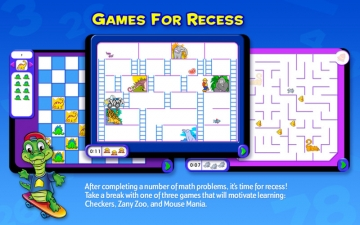 At intervals in the exercises, kids are also rewarded with one of three games: checkers, Mouse Mania or Zany Zoo. Plus, a progress report can be printed at any time, as well as bonus exercise pages and a completion award certificate when finished. 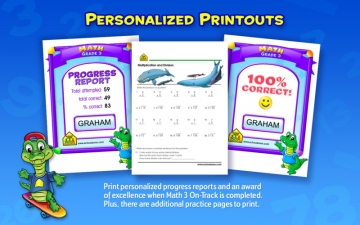 School Zone Publishing Company has been creating children's educational products for over 30 years, so you can trust that School Zone’s software will pack a learning punch. Go ahead, and give your child a healthy dose of learning.